The good weather is slowly returning and with it a rise in sales in both the new and second hand markets. In connection with this, Vismara Marine has announced the order of a new 27.5 metre fast explorer yacht. This new Vismara 90 is an evolution of the Vismara 68 Navetta which incorporates the special requests of its owner to be fast, seaworthy and comfortable and have the range and safety of an explorer yacht. 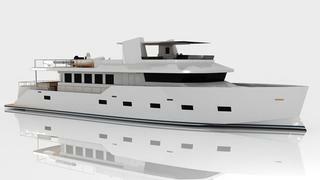 The result is a sophisticate and beautiful motor yacht with a modern design featuring a reverse bow. This choice, one of the first in this range of size, offers a better penetration in the waves allowing good performances in a bad sea. Built in advanced composite materials combined with efficient 6-blade propellers, the Vismara 90 will achieve a top speed of 35 knots and a range of 1,000 nautical miles at 25 knots from her twin 850hp Caterpillar engines. Further, she will glide along at only 15 knots, offering the option to cruise efficiently with low fuel consumption. Special features include a power management system with the possibility of switching to lithium batteries, an anchor system under the hull - more typically seen in sailing yachts - and retractable bollards and hidden winches giving a clean style to the decks. The interior accommodates eight guests in four double cabins, and independent aft crew quarters for four. The Vismara 90 Fast Explorer is scheduled for launch in Spring 2014.